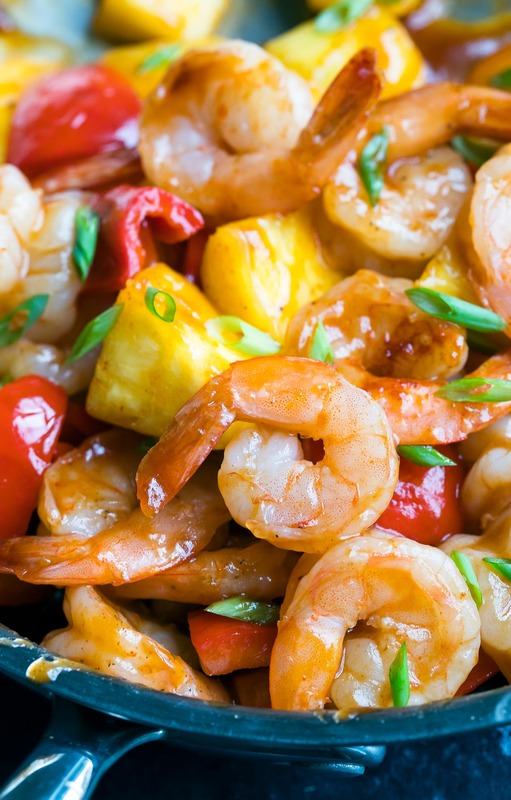 BBQ Pineapple Shrimp is one of our go-to weeknight dinners. This one-pot wonder is quick, easy, and totally delicious! This is one of those magical recipes where all you need are 5 ingredients (7 of you want to get fancy) and about 15 minutes, tops. This sweet and savory one pot wonder is speedy enough for lunch and so freakishly fast and flavorful that your weeknight dinner routine is going to feel like a treat instead of a chore. I’ll take easiest dinner ever for 500, Alex. A leafy green salad makes a fabulous side dish for this saucy shrimp and veggies! Craving carbs? Serve this deliciousness atop a mountain of fluffy steamed rice, fried rice, or quinoa. I’m also pretty sure it would be fantastic over lo mein style noodles or ramen if you prefer to pasta it up. Paleo? Serve it up with your favorite paleo barbecue sauce or try it over cauliflower rice! This dish is easily made whole 30 compliant by using a homemade whole30-approved bbq sauce. Enjoy! So. Much. YUM. 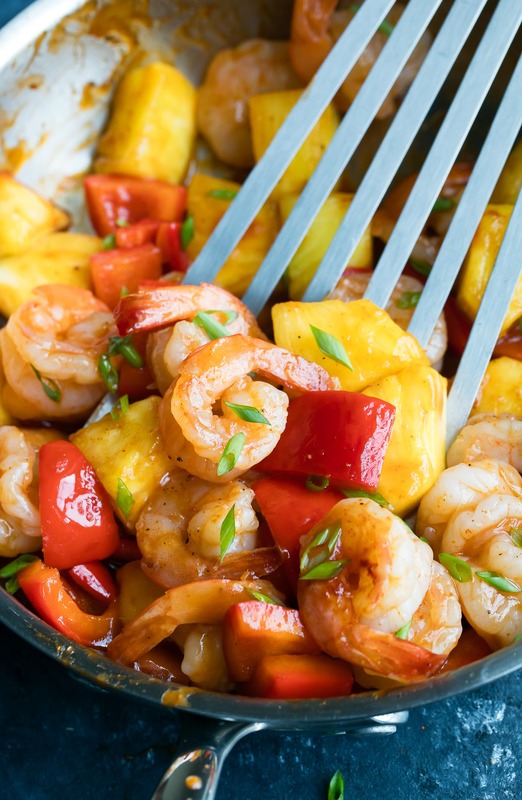 We love this one-pot pineapple shrimp recipe! 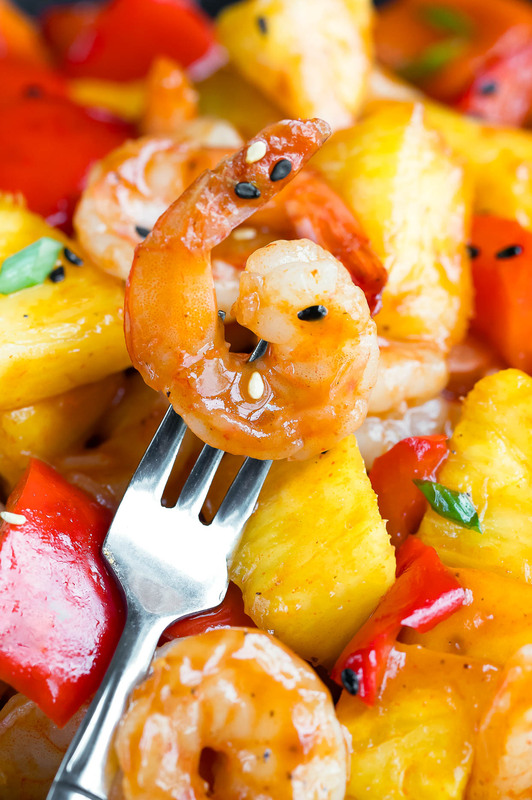 BBQ Pineapple Shrimp is one of our go-to weeknight dinners. This one-pot wonder easy, delicious, and comes together crazy FAST! Recipe yields 2 large dinners or 4 smaller side-dish sized servings. Clean and peel shrimp, defrosting if needed. Lately we've been buying frozen, deveined, easy-peel shrimp. All I have to do is defrost, peel, and cook! You can also buy your shrimp already peeled if you'd like! Pat shrimp dry and season with cayenne, salt, and pepper. Heat a large pan or skillet to medium-high heat with 1 TBSP of butter or oil and sauté your shrimp. Cook on each side for a minute until shrimp curl and become opaque. The cook time will depend on the heat setting you choose and the size of your shrimp, but regardless they’ll be perfectly cooked in a matter of minutes. Transfer shrimp to a plate and add a little oil to your pan. Add peppers and cook until tender, adding the pineapple towards the end. Next add your barbecue sauce (I chose a spicy one - YUM!) and stir it up. Once it's hot and bubbly in the pan, add your shrimp back in and mix it all together. Give shrimp an additional minute to warm back up with the sauce and get ready to dive in! SERVE OVER... rice, fried rice, cauliflower rice, or quinoa! I love using spicy bbq sauce for this recipe. You could also use your favorite sweet bbq sauce and add 1/4 tsp cayenne pepper or extra, to taste. 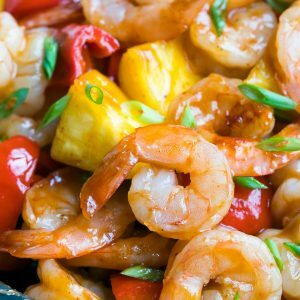 If you get a chance to try this crazy easy BBQ Pineapple Shrimp recipe, let me know! Leave some love in the comment form below or tag your photos with @peasandcrayons on Instagram so I can happy dance over your creation! Not a fan of seafood? You can absolutely make this delish dish with chicken in place of the shrimp. You can even try it with crispy pan-fried tofu! It’s so crazy versatile. No pineapple? No problem! I’ve run out before and made this barbecue shrimp recipe with extra peppers and roughly chopped red onion and it’s absolutely fantastic! Szechuan Shrimp and Broccoli – SWEET + SPICY! Oh yes you’ve done it again! Love the sweet and spicy combo! Thanks Karly! Hope you get a chance to try it soon! Whoa. Going to add this one to the rotation! So much flavor! I love that tropical flavor! So good and perfect for summer!